Surprise. I changed the coloring style again. Took me a while to add the lettering to this one for some reason. It really shouldn't have taken this long but a few things kept holding me back and getting in the way. Either way, we've reached the big stretch of the race. 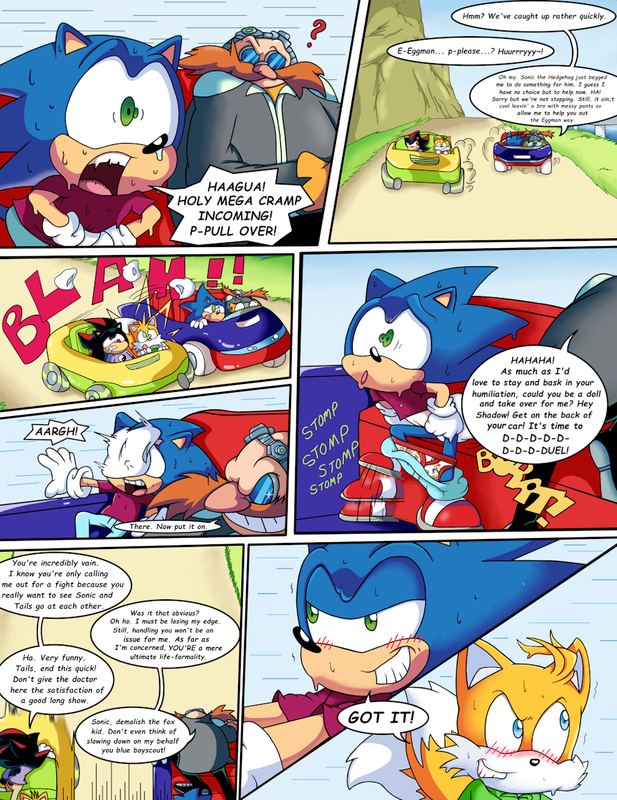 Dr. Eggman is having the time of his life and has gone to the back of the car to have a face off with Shadow while he relishes in seeing Sonic and Tails take their newly formed rivalry across the finish line with them. It's gonna be a smash. Maybe even a literal one. Eggman ramming into the other team's car to get the diaper to flow into their car was a pretty dangerous move. He didn't want to reach into the back seat and grab the ones their team had though. The Eggster lives on the edge... ... also, he's a dangerous sociopath with a long history of violence so there's that too.